Yeah, I've been spending too much time watching Avatar: The Last Airbender. In spite of the title of the anime, I found myself hooked on the idea of firebending, and not airbending. I think earthbending is pretty cool, too (and waterbending for that matter); but I guess I just like playing with fire. Ask my hands - they'll testify to that. Earlier tonight (or last night, actually), I did my first stint as a "ticket seller" - more about this gig in the next post. 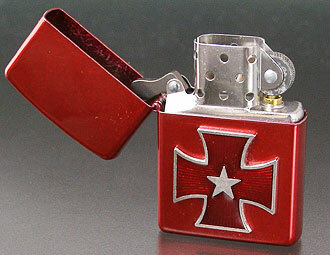 Anyhow, I got this pretty cool Zippo out of it (plus a couple of beers, wooh!). In my excitement, I filled the lighter with too much fluid that it spilled all over my hands. If that wasn't stupid enough, I had to immediately light it. That shiny red cross and glittering star was just too much for me to handle, I guess. You can surmise what happened - the fluid on my hands caught the flames and for a few seconds, my hands were on fire! Either I was tired or I really am overdosing on Avatar, because I didn't panic (for once). Instead, I stood there, stared at my hands (flaming hands) for a second, and thought to myself: "I am firebending. How cool is that?" Then I felt the pain. The fire went out pretty quickly, so it wasn't that bad, but I do have a few tiny blisters now. That's worth firebending. Even if it was for just a few seconds. I need Zuko. Goodness! You're really lucky you didn't seriously injure yourself!! !